Fast, Reliable Repair Services for most models by Tri-Tronics, Dogtra and D.T. Systems. 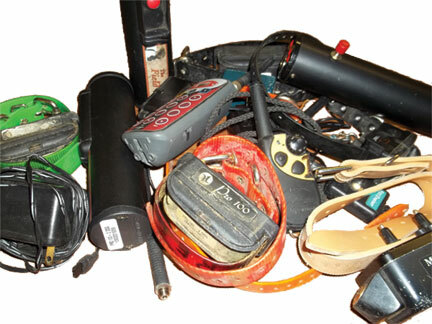 Tri-Tronics G2 and G3, Garmin, Innotek, SportDog and All Tracking Equipment products are not serviceable by Collar Clinic. Please contact the manufacturer for repairs on models we do not service. Note: We do carry user replaceable batteries for most training collars and some GPS collars. Please send the complete system including chargers, antennas, etc. for the repair service. We want to make sure all the components are functioning properly. Trade in Any Electronic Collar, working or non-working, and Get Credit on Your Purchase! We guarantee a minimum trade credit of 10% your purchase up to a maximum of $50.00. As an example, if you purchase a collar for $299.99, your guaranteed credit would be $29.99. Repairable Tri-Tronics, Dogtra, and DT Systems models will have a greater trade value. We will evaluate your system based on model, condition and supply & demand. Our representatives will confirm with you the exact amount we can offer in trade value. You are under no obligation to trade and can elect to have your system serviced for our flat rate fee or returned at no cost to you. For an estimated trade value on your model, Call us toll free at 1-800-430-2010 M-F 8:30-5:00pm ET or e-mail: tradein@collarclinic.com. For actual Trade-In or cash value our technicians will need to evaluate your system. Tri-Tronics repairs are divided into separate catagories: Turn on plug models, Sport Series and Pro Series. The FLAT RATE REPAIR SERVICE FEE covers parts, labor, batteries as needed, Michigan sales tax and the return shipping within the continental US. (Canada add $30.00). We restore your system to the manufacturer's original specifications. The repair service fee does not cover replacement of missing or non repairable accessory items, severely abused, corroded or water damaged equipment. 6 month warranty. Your satisfaction is guaranteed. Repairs are not started until payment is received. Please send your payment or contact information with you trainer to avoid delays. Remote Release Repairs are on the electronics only, price is based on number of receivers as above. If Launchers are sent, there is an addition $40.00 per launcher. Repairs for Tri-Tronics models with the intensity selection dial are completed in 3 business days from the time payment is received. Both the transmitter and collar(s) must be sent in together. **The flat rate does not include the beeper repair or replacement on the Upland or Sport 65 BPR. *Repair rates for Sport 65 and Upland do not include servicing the beeper, a replacement beeper for a defective beeper is available with a repair service for an additional is $60.00. We offer Reconditioned Replacement Transmitters for some of the above models. Call 800-430-2010 to determine availability of a replacement transmitter for your system..
G2 and G3 components are charged in a cradle. Good Used G2 / G3 collar receiver top half sells for $79.00-Subject to Availability. Replacement G2/G3 collar batteries are NO LONGER available. Refurbished G2 and/or G3 transmitter prices varies by model. Replacement G3 transmitter batteries are available. The FLAT RATE REPAIR SERVICE FEE covers parts, labor, batteries as needed, Michigan sales tax and the return shipping within the continental US. (Canada add $30.00). We restore your system to the manufacturer's original specifications. The repair service fee does not cover replacement of missing or non repairable accessory items, severely abused, corroded or water damaged equipment. 6 Month Warranty. Your satisfaction is guaranteed.